The original construction on the Cathedral began back in 1870. However, due to elements such as natural disasters, poor planning and a lack of financing, the cathedral was never finished. However, the fascinating remains stand today as a popular tourist attraction. It is a tranquil relaxing spot, known for its huge windows and striking glass floor. 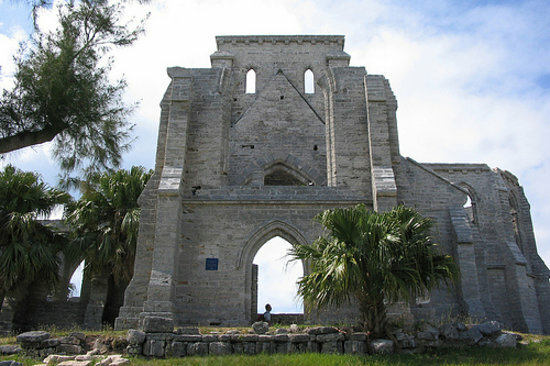 Unfinished Cathedral In Bermuda – Part of Elbow Beach Cycles ‘Things To Do’ in Bermuda series! Get on your bike and visit the Unfinished Cathedral on scooter! Rent a scooter, moped or bike from Elbow Beach Cycles and get 10% off your scooter if you book online NOW. AND, if you book early enough and pre-pay your scooter hire, you’ll get a 15% discount! Email us for more details. Photo of Unfinished Cathedral is courtesy of TripAdvisor.